Can going green actually save you money? Tackling climate change should be at the forefront of everyone’s minds because humankind is now experiencing the largest and most rapid shift in climate that we have ever known. Although climate change is normal and has shifted from one degree to another over the centuries, it is the speed at which it is now occurring that is alarming the world’s scientists and ecological conservationists. Our love affair with industry is a big part of the problem. Burning fossil fuels for heat and electricity and to power vehicles produces the greatest amount of ‘greenhouse gas’ (the Environmental Protection Agency in the U.S say that 33% of America’s greenhouse gas emissions result from electricity production), with cars coming out second place as a major threat to our environment. Burning fossils for petroleum to use in the manufacture of gasoline and diesel for cars, trucks, planes and other methods of transportation accumulates 28% of the USA’s total greenhouse gas burden. The US and China are the world’s biggest contributors of greenhouse gas emissions, pumping out 40% of the world’s emissions between themselves. While Poland only contributes 1% of the total greenhouse gas burden, it is the least carbon efficient country in the EU, requiring more carbon dioxide per gross domestic product (GDP) than other EU countries. The global situation is made all the more critical by deforestation – particularly of the rainforests that are the ‘lungs of the planet’. Trees are felled not only for wood but to provide ranching space for cattle in the production of meat. Trees reduce climate change by absorbing carbon dioxide from the atmosphere, but with less forest to do this, the carbon dioxide builds up. In turn, the carbon dioxide soaks up energy, preventing the dispersal of heat into space and instead trapping it around the Earth, like a blanket wrapped around the planet. This warming effect is causing ice caps to disappear, sea levels to rise and more extreme or out of season weather. Flooding is one of the consequences of global warming. Greenpeace estimate that the 0.6 degree rise in the core temperature of the Earth kills around 150,000 people a year, through accidental death in adverse weather conditions, crop failures from drought and disease. It can be tempting for ‘Joe Public’ to think that there is nothing that can be done or that real change can only be instigated by grass roots activists or those involved in politics. However, positive change begins at home and with each individual and what you do can have a lasting positive impact on our world and even save yourself some money in the process. One of the first things an individual can do to reduce their own carbon footprint is to switch to a renewable fuel source. Renewable fuel can be manufactured from a variety of sources using products that will not run out, for instance using wind turbines, solar panels, water (hydropower), geothermal energy (obtaining hot water from deep underground by the use of wells. The water is heated by magma at the core of the Earth and then harnessed by people to heat their homes) and biomass fuels. Biomass fuels are those that are manufactured using waste products such as landfill garbage and landfill gases, wood waste, plants, manure and animal fats. Crops and sugar canes can be fermented to produce ethanol (alcohol) which can then be used to manufacture gas and transportation fuels. Once the stuff of science programs and too expensive to be accessed by most people, renewable forms of energy are now being produced more widely, bringing the cost down and making choosing green energy a viable option for families. As money.co.uk explain, even though tariffs may be higher than with fossil fuels, running renewable energy projects brings economic benefits to areas away from urban centers, where employment may be lacking and they encourage tourism, effectively bringing in more money to the local community. 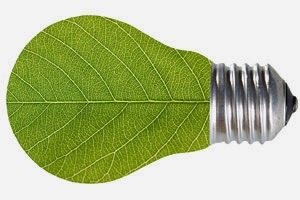 As the energy is taken from resources already available, it costs less to run manufacturing plants with little or no wastage to deal with, so not only does the company concerned not have the headache of how to deal with pollution and clean up bills, they also leave a much smaller carbon footprint on their environment. Due to all these factors, the cost of having green energy in your home will eventually reduce to a level lower than current fossil fuel tariffs. If you can, use a bicycle to get to work instead of your car. Even if this isn’t possible every day, reducing the amount of times you have to use your car will not only reduce carbon emissions but it will make your fuel last longer and make driving cheaper. Make sure you service your car regularly as a car that runs smoothly and with no faults will also be more fuel efficient. Get green energy (see above). Turn off the light if you don’t need it! Only using lighting for the room you are in, remembering to unplug items when you aren’t using them (such as the cooker, washing machine, toaster etc.) and not having your TV on standby will reduce emissions and leave you more money in your pocket. Choose electrical items that can take rechargeable batteries and re-charge them each time instead of buying new batteries. When boiling the kettle, only boil the amount of water you actually need. It takes much more energy to boil a full kettle and then you will probably only re-boil the water again at a later time. Eat less meat – The Norwegian military have already been put on a vegetarian diet in order to counter the global warming problem. By eating less meat, you reduce the need for cattle and in turn, reduce deforestation for cattle ranching and well as methane gas emissions. Eat more foods that don’t need cooking, such as salads, and choose meals with a quick cooking time to reduce energy consumption and reduce your bills. Use re-usable shopping bags – this reduces the energy wasted to produce them and reduces the world plastic waste burden. Switch all your bills from paper bills to online ones. The paper industry is the largest consumer of water in first world countries and the third largest greenhouse gas emitter. By getting your bills via email, there’s no need to receive them via letter, reducing the need for paper. In addition, say no to junk mail. Each person gets on average 16 items of post a week that are ‘junk’ mail, usually advertising. To send you all this junk mail, a staggering 100 million trees have to be felled every year, contributing to the global warming effect. Even if you recycle your junk mail, 28 billion gallons of water are wasted producing and then recycling junk mail items.